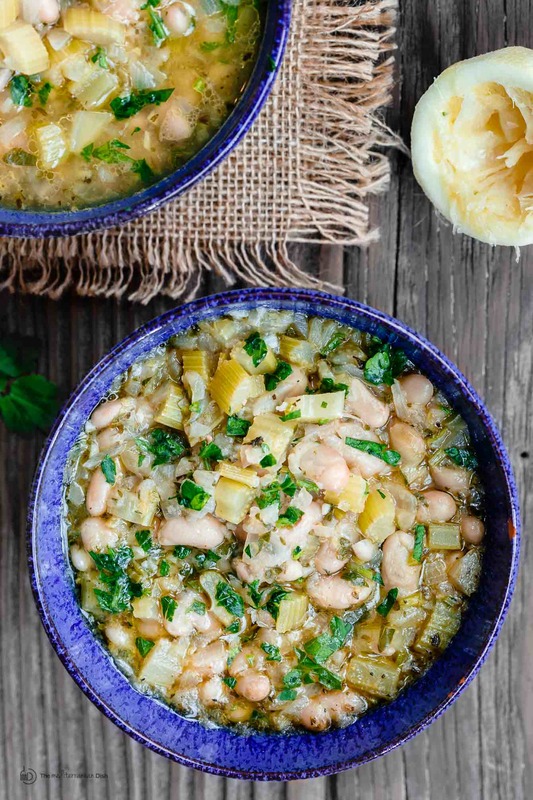 A quicker Fasolada (Greek Bean Soup) makes for a delicious and satisfying weeknight dinner! 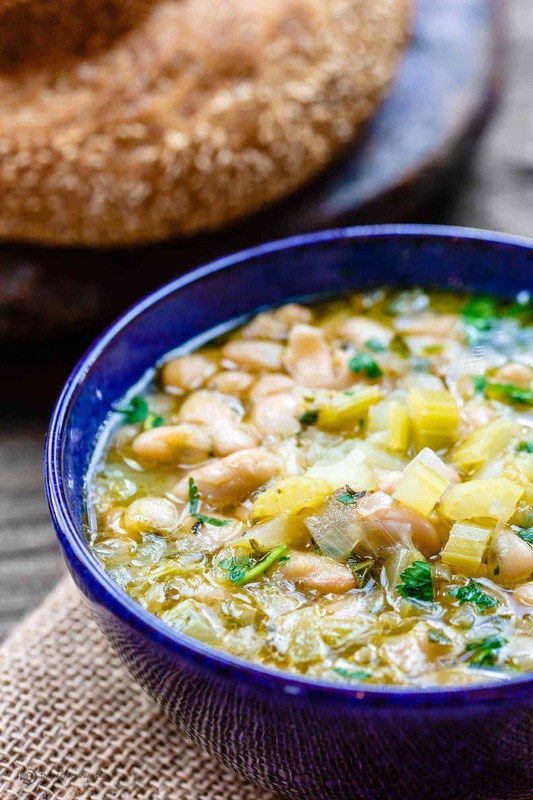 Fasolada is a popular Greek bean soup, occasionally referred to as the national food of the Greeks! 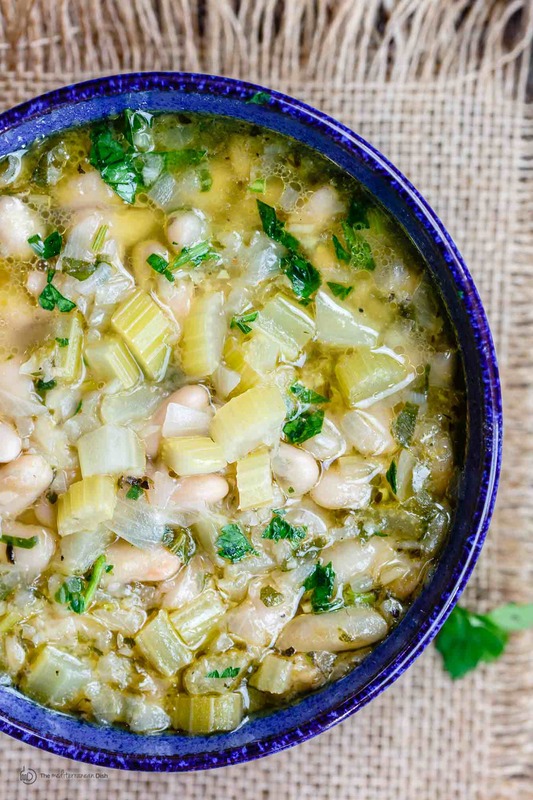 The star ingredients in this simple bean soup are: white beans, celery, and extra virgin olive oil–in fact, a healthy amount of quality extra virgin olive oil makes all the difference. Some variations of Fasolada include carrots and tomatoes. And if you want to stick with tradition, you’ll want to start with dry white beans, soaked overnight. But this recipe takes a more modern, quick-n-dirty approach! The key difference is in using canned beans in place of dry white beans. Needless to say, this small change shaved off a few hours of soaking time, immediately transforming Fasolada into a weeknight recipe. Yes, we take a shortcut here, but we don’t give up flavor. Absolutely not! At the outset, I use a combination of onions, garlic, celery and bay leaf. Warm spices are stirred in to continue adding aroma and depth. 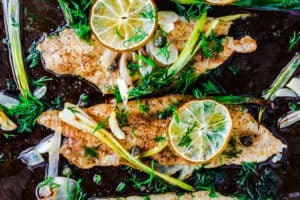 Finally, a splash of zesty lemon juice and fresh parsley add brightness. 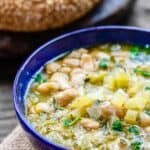 What to serve with Greek Bean Soup (Fasolada)? When we eat fasolada for dinner, my family typically starts with a bright salad like this traditional Greek salad, or maybe even fattoush salad. 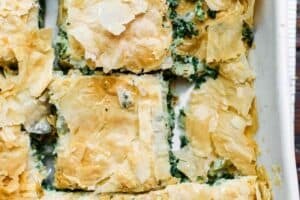 No need for too many sides, just add some Greek olives and your favorite rustic bread. In a heavy pot like this one, heat 2 tbsp extra virgin olive oil over medium-high heat. Add the chopped onion, salt and pepper. Cook for about 4 minutes over medium-high heat, stirring regularly. Now add the garlic, celery, bay leaf, and oregano. Cook 5 more minutes, stirring regularly. Add broth, cannelini beans, cumin, paprika and cayenne pepper. Raise the heat and bring to a rolling boil for 3 minutes or so. Reduce the heat to medium-low, cover and simmer for 10 minutes. Ladle 2 cups of the soup into the bowl of a small food processor or blender. Blend, then return to the cooking pot. Simmer for another 5 minutes. Remove from heat. Off heat, stir in about 1/3 cup extra virgin olive oil, the lemon zest, lemon juice and parsley. Transfer to serving bowls and top each bowl with another drizzle of extra virgin olive oil, if desired. 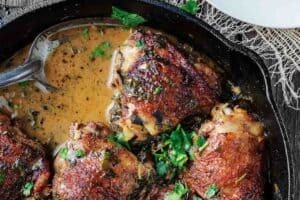 Serve with your favorite rustic bread. 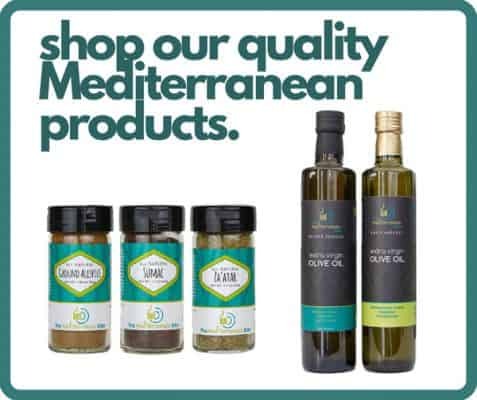 Visit our store to browse our all-natural and organic spices, olive oils and bundles! Made this last night. Forgot to buy a lemon so I used 1/4 t zest and 1/2 t lemon extract. Lovely. Somehow both light and hearty. Love hearing this, Pat! Thanks so much for giving it a try! This soup is amazing. The flavors are exquisite. Comforting, spicy, bright – so interesting are the flavors that we couldn’t stop eating it! I added carrots just because I had them and a splash of wine because I was short on the chicken broth – all delicious! Thank you for this recipe. Jane, thanks so much for sharing your variation! So glad you enjoyed it. This nutrition information cannot be correct…..894 cal/serving with 45.7 grams of fat per serving???? Katherine, thanks for sharing. We ran the info again through the nutrition calculator. It must have been some odd glitch; this is a best estimate still. Loved this soup! Was looking for something light (no pasta!) with lots of flavor. This was the perfect choice! Pretty much followed recipe except I didn’t have fresh parsley on hand so used dried and my lemon was pretty close to not being used so zest not possible but juice was good. Quick, flavorful, filling but light on calories. Keeper for sure! Thanks for posting. 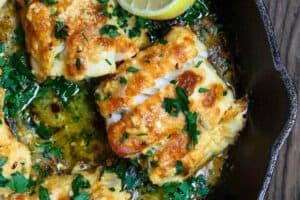 Everyone loved this recipe! Excellent! So glad to hear this worked out for you, Mary! Made it exactly like the recipe….Delicious! The brightness of the lemon and the heat of the cayenne is a perfect balance. Will definitely make again and again. Thank you for this keeper. Just finished making this. It is delish! I am always amazed at what a squeeze of lemon does to soups! I hope it gets more tasty as it sits. I made it to take for work lunches. Happy New Year!! I made this recipe yesterday and it turned out perfectly. 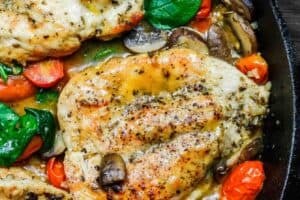 There is a lot of flavor in this soup, and it was so easy to make! This will be a recipe I’ll make again and again. Wonderful Sheila! So glad to hear it! The best! Makes me all warm inside!! Glad you liked it, James! This one is definitely a warm-your-heart type meal. Yay! Thanks for giving it a try!